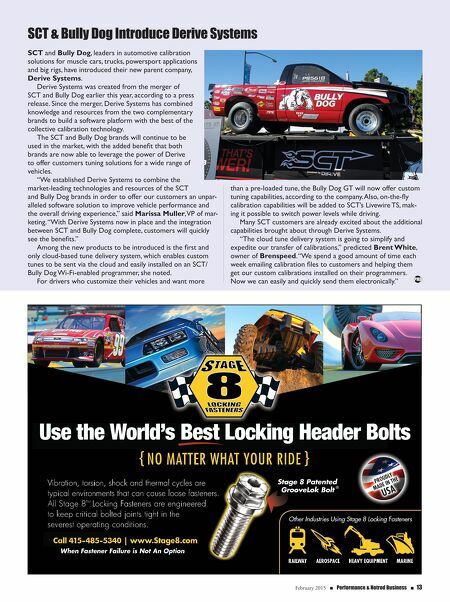 February 2015 n Performance & Hotrod Business n 13 SCT & Bully Dog Introduce Derive Systems SCT and Bully Dog, leaders in automotive calibration solutions for muscle cars, trucks, powersport applications and big rigs, have introduced their new parent company, Derive Systems. Derive Systems was created from the merger of SCT and Bully Dog earlier this year, according to a press release. Since the merger, Derive Systems has combined knowledge and resources from the two complementary brands to build a software platform with the best of the collective calibration technology. The SCT and Bully Dog brands will continue to be used in the market, with the added benefit that both brands are now able to leverage the power of Derive to offer customers tuning solutions for a wide range of vehicles. 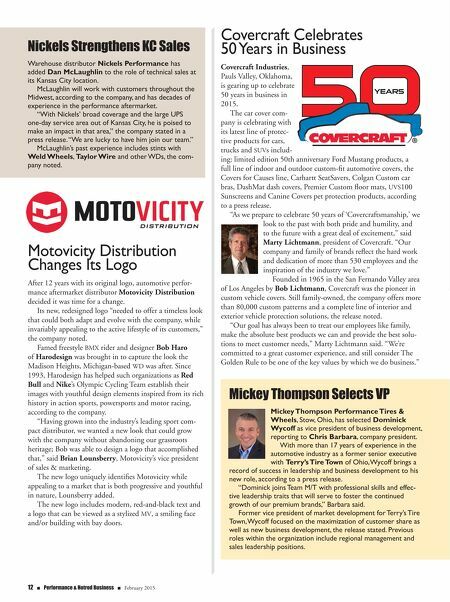 "We established Derive Systems to combine the market-leading technologies and resources of the SCT and Bully Dog brands in order to offer our customers an unpar- alleled software solution to improve vehicle performance and the overall driving experience," said Marissa Muller, VP of mar- keting. "With Derive Systems now in place and the integration between SCT and Bully Dog complete, customers will quickly see the benefits." Among the new products to be introduced is the first and only cloud-based tune delivery system, which enables custom tunes to be sent via the cloud and easily installed on an SCT/ Bully Dog Wi-Fi-enabled programmer, she noted. For drivers who customize their vehicles and want more than a pre-loaded tune, the Bully Dog GT will now offer custom tuning capabilities, according to the company. Also, on-the-fly calibration capabilities will be added to SCT's Livewire TS, mak- ing it possible to switch power levels while driving. Many SCT customers are already excited about the additional capabilities brought about through Derive Systems. "The cloud tune delivery system is going to simplify and expedite our transfer of calibrations," predicted Brent White, owner of Brenspeed. "We spend a good amount of time each week emailing calibration files to customers and helping them get our custom calibrations installed on their programmers. Now we can easily and quickly send them electronically."